A roll of Gaffer's tape - it truly has a thousand uses, many of them to do with music. You'll need at least a snare batter and bass batter. Keep a spare head in each drum case. If you can afford to have a spare, take an extra snare drum - on a stand and ready for action. Head-damping materials - a tub of Moongel or a selection of 'O' rings will work. Cut the latter into quarter circles. If all else fails, head back to point number one on this list. 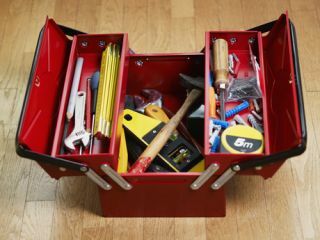 A small craft/tool box or the like containing: screwdrivers (flat and Phillips), pliers, tweezers, scissors, Allen keys, hammer etc. Or if you want to be flash, the Roadie's friend - a Leatherman. Cymbal felts and plastic sleeves, washers and wing nuts. Snare tie-cords or tapes. Bass drum spring and hi-hat clutch. Many companies sell pre-packaged spares kits and some or all of the above. They're convenient and not usually too expensive.